Comes in waist sizes 28-58. It is made from premium python snake skin. Comes with 7 holes spaced 1 inch apart. It comes with a beautiful square chrome over solid brass buckle. 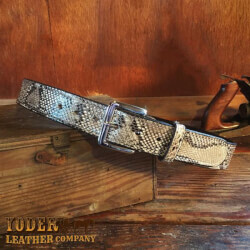 This snake belt is backed with a layer of high grade black cowhide to give it added stability. It is finished with heavy nylon stitched around the edge.